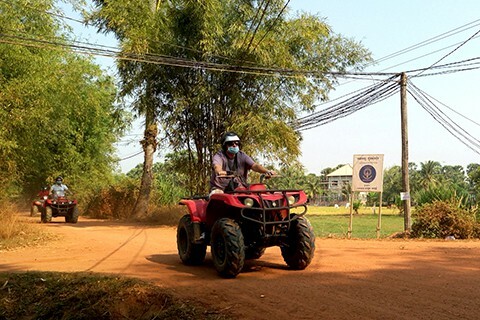 Quad Adventure Cambodia offers ATV tours in and around Siem Reap town. We have a range of day tours, overnight, and multiple day tours available. Riders of all levels are welcome and we have many routes available to suit everyone from beginners to expert riders. 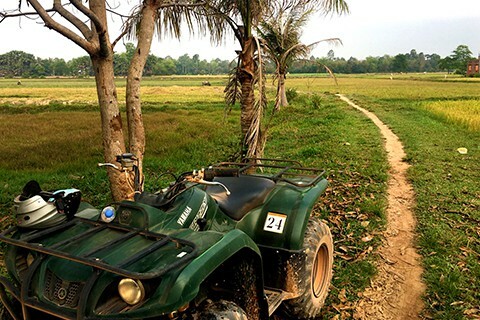 Get to experience the beautiful Cambodian countryside on the back of a powerful ATV! All prices quoted on this website are included with 10% VAT – There are no hidden charges. 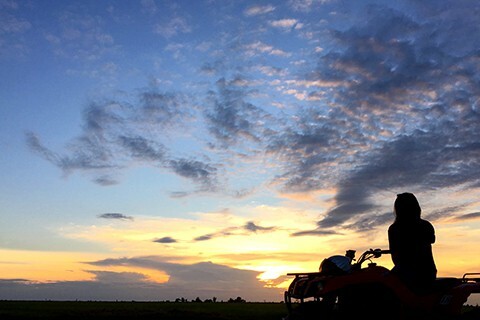 Start this tour at 5pm and see the pink Asian sunset over the stunning Cambodian countryside. Then ride back to Quad Adventure Cambodia HQ! Take an easy ride around the outskirts of Siem Reap town through the local villages. 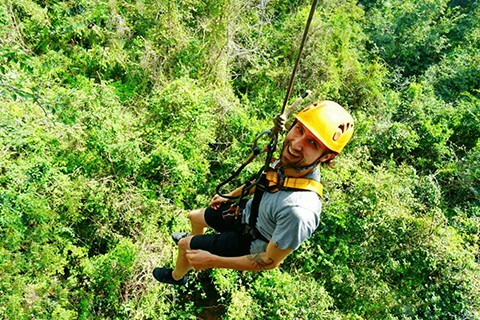 This 1 hour 15 minute tour is perfect for people who want a quick adrenaline rush! 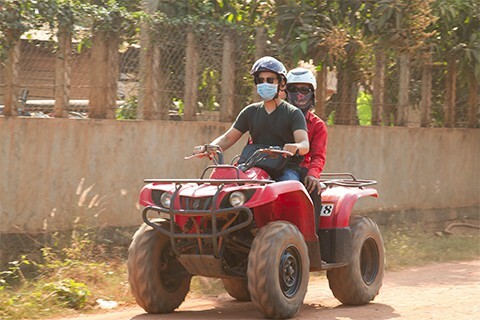 On this tour you will experience an offroad adventure of a lifetime around Siem Reap. Get to see local villages, and a lot more on this 2 hour 15 minute tour. This half day 4 hour tour will take you outside of town and into the countryside around Siem Reap. You'll have 4 hours to enjoy some ATV action! This full 8 hours of riding adventure will take you on a adventure of a lifetime through the Cambodian countryside getting some off-road fun! Did the half day tour with Quad Adventure and it was worth every single cent!! No matter what do not miss out on this since its just amazing. Also do visit the tall houses and see the life of the locals!! interesting and humbling experience and do not forget to take some food for the little kids!! Take a 1 hour and 15 minute quad bike tour and zipline through the jungles where you can enjoy platforms, ziplines, bridges and more! 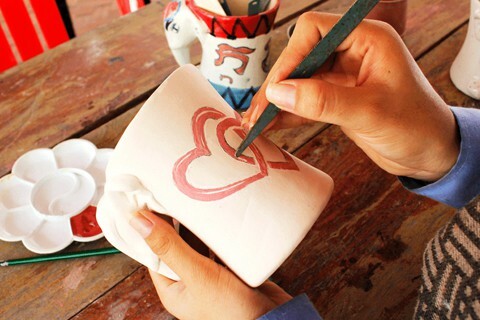 On this tour, you can learn how to make traditional Khmer pottery and take an exciting quad bike ride through the countryside. 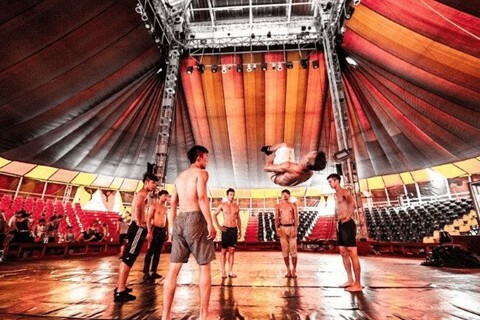 See the amazing and very talented Phare Circus performance in the evening with a morning or afternoon quad bike tour earlier in the day. 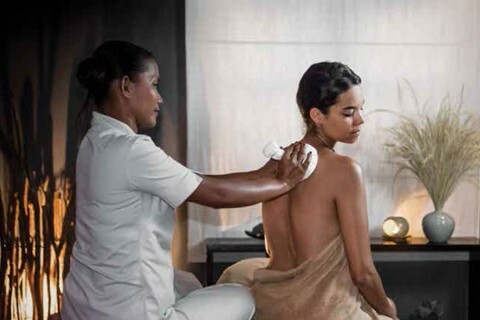 There's nothing like a full aromatherapy spa experience at one of the most popular spas in Siem Reap after a ride on a quad bike! 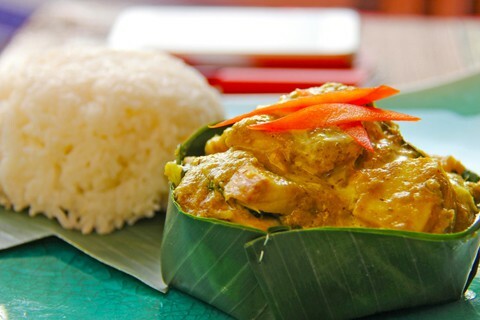 Learn how to prepare and cook popular tradtional Khmer food. You'll learn three dishes. Enjoy a trip on the quad bikes for some adrenaline! 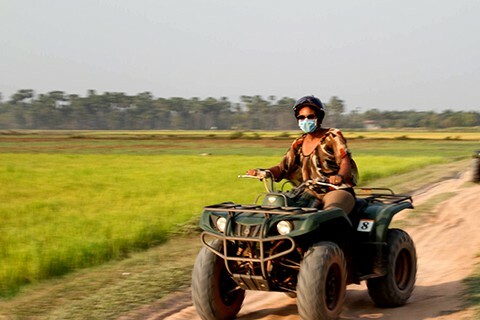 On this tour, you'll spend the afternoon exploring the countryside and areas around Siem Reap on a quad bike before spending the night in a Khmer village. 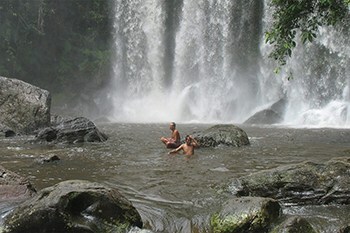 This full DAY riding adventure will take you on a adventure to one of the most sacred spots in the whole of Cambodia. We won TripAdvisor's certificate of Excellence in 2015, 2016, 2017, and 2018. We are proud that we provide high-quality, professional and exciting quad bike tours in Cambodia and that our team are regularly recognised for their dedication and hard work. 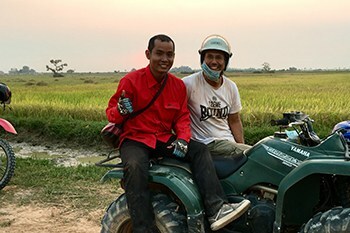 If you want to come and join a fun an exciting quad bike experience in Siem Reap, then you’re in the right place. We make it easy for you to come and have fun. We’ll come and get you from your hotel or guest house, provide you with safety equipment, and test your riding ability to ensure you get the best routes for your level. Can 2 adults ride on the same quad bike? Yes, as long as the combined weight of the 2 people is under 130kg. The driver must have experience of riding a quad bike and pass the necessary driving test with our instructors. I have never ridden a quad before, can I reserve a tour? Yes. Everyone can book a tour and instructors are always on hand to help you. We have various routes available to suit all levels of driving. Is a driving license required to ride a quad bike? Yes. However, exceptions can be made for people who don’t have a driving license but do have experience of riding quad bikes. All our guests are subject to a test to check their ability before going out on their own. If you don’t want to drive, you can go as a passenger with one of our tour guides. Do I recieve safety instructions before I leave? Yes, all guests will be given instructions prior to leaving. We will go through safety procedures and test your riding ability. We will also choose a suitable route depending on your ability and what you want to see. Are the quad bikes automatic or manual? Our quad bikes are automatic. You don’t need a clutch or change gears to operate them. What is the minimum age required to ride? Children are welcome to come as passengers with their parents. 14 to 16 year olds must ride with an instructor as a pillow. 17 year olds can ride a quad alone if they are a similar size to an adult and can pass the driving test. Can I book by tour the day before? Yes, but it can be risky becuase we have a limited number of quad bikes available. To avoid disappointment, we recommend to book as soon as possible by filling in the booking form on the relevant tour page. You will need to provide us with all the information necessary so we can arrange to pick you up from your hotel or guest house. What is the next step after I fill in the form? We will confirm you booking within 24 hours and let you know the pickup time from your hotel or guest house. No, our departures are scheduled and we cannot be flexible. How many people will be in a tour group? We always try to organise groups to be as small as possible. We can even do a private tour if its possible. Yes, helmets and face masks are provided. Guests are recommended to wear long trousers and strong shoes. If I have my own transportation, what time should I arrive at your place? You should arrive 15 minutes before departure time as we need to give instructions to everyone. Please make sure that your driver knows our location. To avoid disappointment, we strongly recommend the free pick up service. No, we only accept cash in USD or Khmer Riel.